You will be met on arrival at the Jomo Kenyatta International Airport or hotel to be briefed by a company representative and then drive through the floor of the Rift Valley to the world famous Masai Mara Game Reserve. You will have lunch en route arriving at camp/similar in time for lunch. At 1600hrs you can enjoy an afternoon game drive in the reserve. Dinner and overnight will be at the camp. Kenya's greatest concentration of wildlife the Masai Mara is the most Kenya's most popular game park, with the high chances of seeing all the big five and many other species of game. This is where the great wildebeest migration is a spectacle to behold for any would be visitor to Kenya mainly from July to October every year.Masai Mara has been named as the 7th wonders of the world because of the great wildebeest migration. 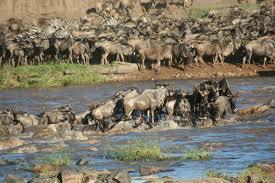 We also have the walking safari as well as balloon safari in Masai Mara. After an early morning breakfast we will have a game drive en-route to Nairobi City. We will have stop-overs in the towns to give you a chance to buy souvenirs. We will arrive late in the afternoon. Afterwards we will take you the airport or to your preferred hotel. End of Masai Mara Safari.